In order to provide the optimal protection of cartilage, the hyaluronic acid is now available as a special formula - combined with chondroitin, as so called HCK. These two basic components of synovial fluid, due to their synergic interaction, act much more effectively than when applied separately. The effectiveness of the chondroitin has been proved to depend on the presence of the hyaluronic acid in its natural concentration. 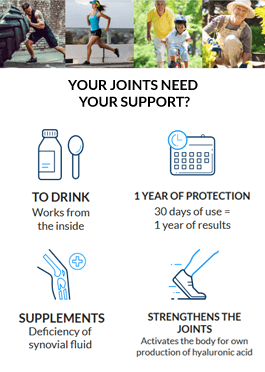 The chondroitin administered in supplements does not act on its own - it is only the HCK which activates chondrocytes, which are later capable of transforming into chondroitin. This is the main reason why the HCK complex - the hyaluronic acid and chondroitin - shows much better effects than each of its components applied separately. The researchers in Germany combined the hyaluronic acid and chondroitin sulfate together into a unique, powerful complex, which is used as the active substance in HYALUTIDIN HC Aktiv Taking into account all the above mentioned properties of hyaluronic acid and chondroitin sulfate it can be concluded that the synchronic supplementation of both substances will provide the joint and cartilage with the major components to promote the healthy motor system and maintain healthy, flexible joints and mobility. HYALUTIDIN HC Aktiv is designed precisely for oral application and it contains a very well-absorbed complex of hyaluronic acid and chondroitin to foster the cartilage regeneration (protective influence of chondroitin) and enable the painless movement of joints (due to the significant role of Hyaluronic Acid in supporting joint lubrication and movement).